MORE THAN 14,000 people have been caught on their mobile phones while driving so far this year. And they haven’t just been making and taking calls. Posing for selfies, updating Facebook and live-streaming their every move are just some of the other things that Irish drivers have been found doing this year. Commenting on the figures published by TheJournal.ie today, the Road Safety Authority (RSA) said that distracted driving is a factor in as many as 20 to 30% of all collisions in this country - and the current biggest distraction for drivers is their smartphones. “Use of mobile phones while driving is a big problem on Irish roads. Too many people still drive while on their phone – taking calls, texts, Snapchats, even updating their social media channels and checking their emails while driving,” said Moyagh Murdock, chief executive of the RSA. Data provided by the Department of Justice shows that as of 30 June 2017, 14,046 drivers have been given Fixed Charge Notices (FCNs) for using a mobile phone while driving. If that trend continues the numbers will be on par to what we saw over the past two years, meaning that despite information campaigns, we’re not getting better at putting down the smartphones. The number of FCNs issued to those caught holding a mobile phone while driving in 2015 was 28,777. The corresponding figure last year was 28,121. A recent survey commissioned by Aviva Insurance found that 84% of drivers in Ireland admit to using some form of electronic device while driving. “Mobile phone use has become much more complex now,” explained Murdock. It is not just a matter of making a phone call… People are checking their social media, they are actually streaming and uploading videos, they are actually putting photos up. Crazy behaviour. Murdock says the RSA has seen this manifested in rear-ending accidents as well as more serious ones where people are injured or killed. The Aviva survey, which polled drivers from 13 countries around the world, found that the number of Irish drivers who admit to texting behind the wheel is double that of the UK. It is against the law to drive a car while holding a mobile phone under Section 3 of the Road Traffic Act 2006. 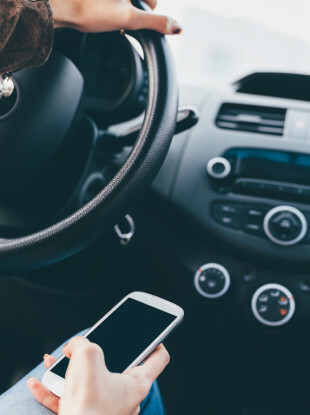 Currently, a person caught holding a phone while driving will be hit with a punishment of three penalty points, rising to five if the penalty is unsuccessfully challenged in court. They are also dealt with by way of a Fixed Charge Notice, which range from €60 to €90. And when you look at the stats, we do appear to have a problem with putting the phone away. Last year, according to gardaí, an average of 76 people were detected for mobile phone offences every day. So, how can we deter drivers from using their mobile phones when driving? One car manufacturer has decided to reward drivers that put down their mobile phone. Toyota Ireland, in partnership with the RSA, has launched a new mobile phone app which aims to reward all drivers for putting their phone face down when driving, allowing them to redeem the points for a free tea or coffee at Topaz Re Store outlets. The Face It Down app has been endorsed by the Irish Road Victims Association. It allows drivers to accrue points which can be redeemed against a complimentary hot drink for every 350 kilometres travelled. A total of 250 bonus points will be awarded for a user’s first successful journey with bonus points also given at interim periods. Murdock said that the RSA was supportive of the campaign, and reiterated the message that being on a phone call will make you four times more likely to crash, while texting makes people 23 times more likely to be involved in a collision. This isn’t the first initiative that has tried to raise awareness about the dangers of using a phone while driving. The RSA has already launched a number of campaigns, including this video last year. This isn’t just a problem in Ireland. As far back as 2010, campaigns in the US – such as the TV host Oprah Winfrey’s ‘No Phone Zone’ movement – attempted to raise awareness with hard-hitting interviews from victims whose lives had been destroyed in just a split second. Due to drivers flouting the laws in the UK, the authorities there decided to introduce stricter penalties. It has been illegal to use your mobile phone while driving in the UK since December 2003, but new laws were introduced on 1 March of this year. The punishments for using your phone behind the wheel were doubled, increasing to six penalty points and a £200 (€220) fine. The driver could also face disqualification. Transport Minister Shane Ross told TheJournal.ie in Februrary that he is open to increasing penalty points for some offences if it saves lives. He said his department is reviewing the new laws in the UK to see if possible changes can be made to the Irish system. Ross said his department would monitor the UK laws “to see how they’re going, and we will change them if necessary”. “I have no problem in increasing penalty points if I thought it was necessary. It’s because there is human life involved,” he said. The minister has also discussed how to tackle mobile phone use while driving with families of the victims of road accidents. A spokesperson told TheJournal.ie that the department is looking at dealing with the issue but admitted their main focus at present is tackling the issue of drink-driving. Last week, gardaí announced that drivers caught for even the most minor offences will now be subject to a drink-driving breath test. A survey conducted by the RSA identified that a group of ‘high risk drivers’, especially those that admit to using a mobile phone while driving, are twice as likely to have admitted to drink driving in the past 12 months. Garda Chief Superintendent Aidan Reid said driving while using a mobile phone is a “high risk activity”, stating that drivers texting behind the wheel is a particular problem. “They should not be holding a mobile phone while driving. Anyone that is found carrying out this offence – or whether it is breaking a red light, speeding – are subject and will be subject to breath testing to identify if they have been drinking,” he said. Email “Over 14,000 drivers caught on their phones in 2017 - and some were posing for selfies”. Feedback on “Over 14,000 drivers caught on their phones in 2017 - and some were posing for selfies”.